Star Wars Episode 1 is popular in our house in a BIG way. The kids want to watch it all the time. So maybe it’s not such a bad movie after all. One of the proudest, most exciting moments for me and a parent has been sitting down to watch Star Wars series for the first time with my kids. I stuck with tradition and we watched the movies in the order that they were made: IV, V, VII, I, II, III and then more recently VII. I have read some pretty compelling arguments that Star Wars should be watched in the order of IV, V, II, III and then VI. Did you notice something about that order…? What happened to Episode I?!?! 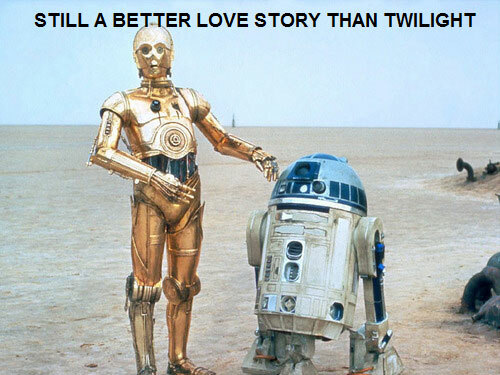 Yep, some Star Wars fans recommend skipping it altogether. And I get it. I do. It’s not exactly the best movie – and doesn’t necessarily add a lot to the overall storyline. But I’m not convinced it be skipped entirely. I absolutely agree that under no circumstances should someone be introduced to Episode I first – because you’ll be robbing them of the big “I am your father” reveal and also Episode I isn’t really indicative of the style and quality of the rest of the movie franchise. So, why is it that despite Star Wars Episode 1 being the underwhelming awkward addition to the Star Wars series is the most watched movie in my household at the moment? Because it’s essentially a children’s movie. 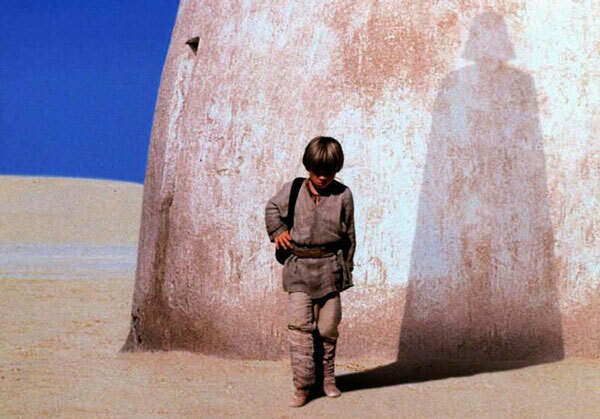 For most viewers Star Wars is Luke Skywalker’s story. The Prequel Trilogy fleshed out the story of how Luke’s father becomes his enemy – but that’s not how my 7 year old sees Star Wars. It’s ALL about Darth Vader. 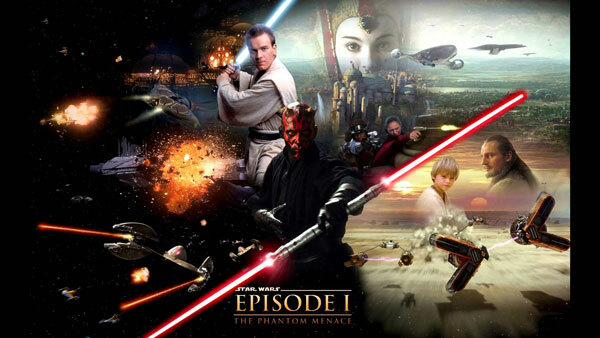 When Episode I came out in 1999 I was 12 years old and Padme Amidala was the first young female character I had to connect with in. The whole mess around with her disusing herself as her own maid so she could go traipsing around Tattooine with Obi Wan and Qui Gon Jinn seems like a bit of a pointless exercise watching as an adult, but that reveal that she was actually the queen was a pretty big highlight to me as a girl. … Okay… so…. Full disclosure… I hate the whole pod race sequence. It’s way too long, I find it incredibly boring and it’s pretty unnecessary to the plot BUT my kid loves it. 9 year old Anakin enters an impossible race and wins against all odds. The kids will watch this scene in a trance – which is my cue to go wash dishes or tidy up – anything other than watching it. *grroooaaann* Yes. I know. He’s the worst. Literally the most annoying character that has ever been created. But, if 7 years of parenting has taught me nothing it’s that the more irritating a character is the more children love them. At the same time this could be a deal breaker for Episode I because of the number of times my kid has said “Howww Woood!” lately – obviously he’s quite keen on Jar Jar. Am I the only one who’s excited that Episode I was the first time that C3PO meet?!? It’s a very important moment, it’s the beginning of their long and occasionally troubled relationship. Also fun fact to wrap your head around is that Darth Vadar built – or at the very least repaired – C3PO. This lightsaber battle receives some criticism for being amusingly inaccurate, but that aside it is an amazing battle, especially with the introduction of the double ended lightsaber. 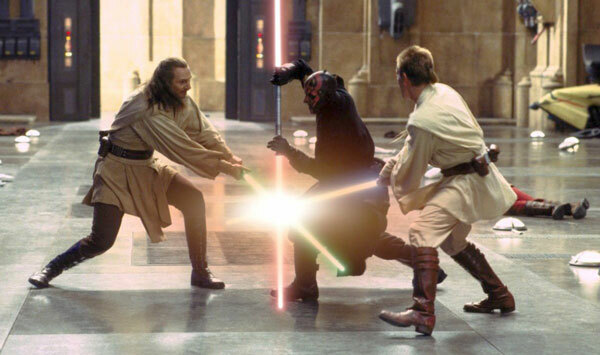 It is still one of my favourite lightsaber battles in the movie series. This Song. Actually – if you do plan to skip Episode 1 just listen to this and you’ll be caught up entirely. So, what do you think? Is Star Wars Episode 1 bearable? Or should you skip it altogether?